Lots of power in a small package. 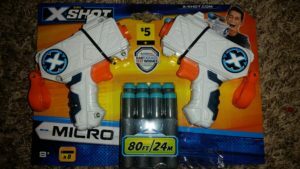 Possibly the most common Xshot blaster I’ve seen in stores is the Micro. It’s easy to find in various dollar stores, as well as the “cheap toy” section of Walmart. It’s small size makes it comparable to a Nerf Jolt. However, newer packaging has increased the range claims to 80ft. Is that much performance possible out of this blaster (with the included darts)? The answer is, surprisingly, yes. I’ll admit, I don’t usually read the fine print on blaster packaging. After all, it’s typically things like company contact information, disclaimers, patents pending, or similar bits of info. 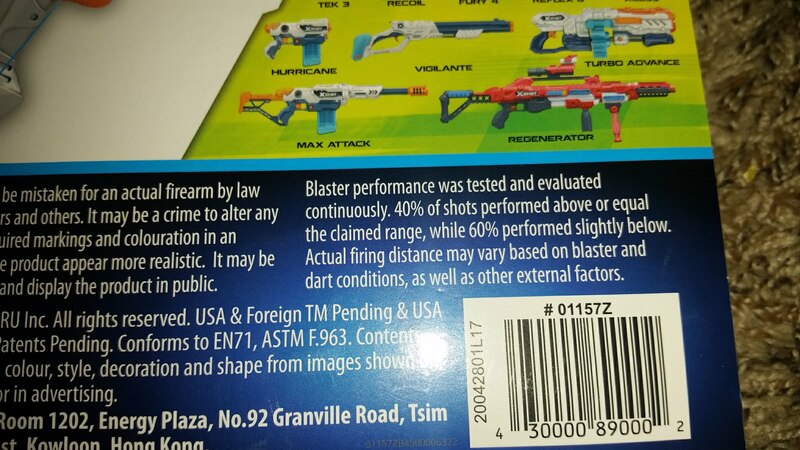 However, I noticed on the back of the Micro’s package that Zuru listed their testing methods.for their blasters! I went back to the Reflex packaging to check if it was there as well (it was). 40% of shots in testing meet or exceed the claim. As always, other external factors, other darts, etc. can affect firing distances. Now I know! As mentioned above, the Micro has been around for many years, in different colors. I happened to have one of the original Pink Series ones on hand. (Review on my old blog for reference). The shell itself is the same. And there are slight differences on the inside. However, those differences do quite a bit. The rather unique plunger setup is still present – it’s still a real plunger tube, but the plunger itself is wide enough to fit the barrel inside. It’s halfway between a regular and reverse plunger, but it works for a blaster this size. The springs, however, are different. On the newer version, there are fewer coils present, and the spring is noticeably stiffer. So over the same draw length, you have more power. 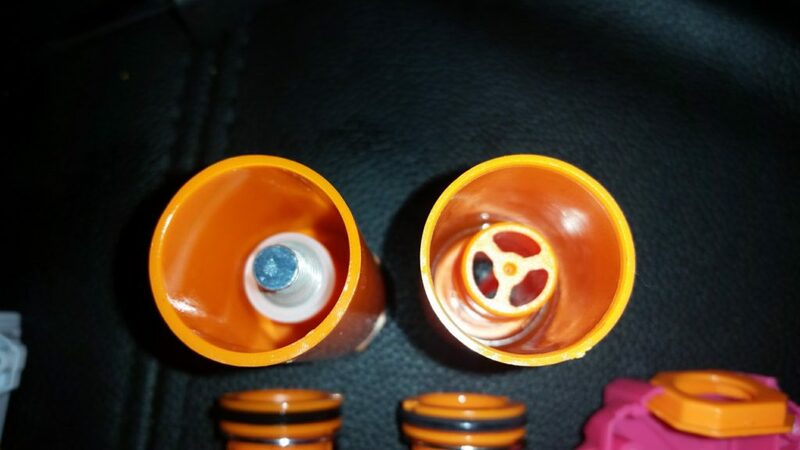 Inside the plunger tube there is another difference. The old version had a very short spring inside, acting as a plunger cushion, but only a dart peg in the barrel. The new version does away with that extra spring and adds a real safety valve on the barrel. 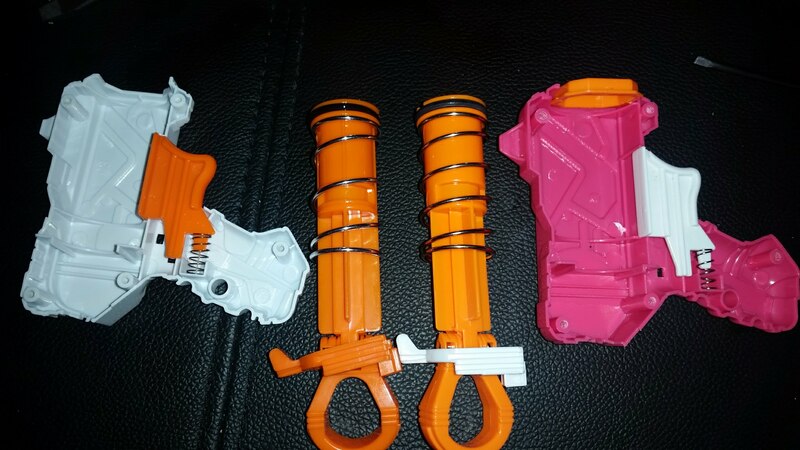 Downsides: THE BLASTER IS TINY. Even kids may be lucky to fit two fingers under the trigger. The shell is solidly made, but the small size is uncomfortable. But Does It Shoot Harder? Using a proper chronograph, the old version of the Micro (also called the Mini) averaged 58fps with Xshot darts. The new version averaged 73fps. That’s actually quite impressive. Outside, that does roughly correlate to the 80′ claims as explained on the back of the packaging. Granted, Xshot darts aren’t exactly a paragon of accuracy, but the claim stands. For $3 each (or $5 if you find a two pack at Dollar General), the newer Xshot Micros are the real deal. They’re easy to hide in your pocket, and pack better performance than the Jolt, the nearest comparable blaster. If you can get over the issues of comfort, it’s an effective blaster for stealth or desperation. 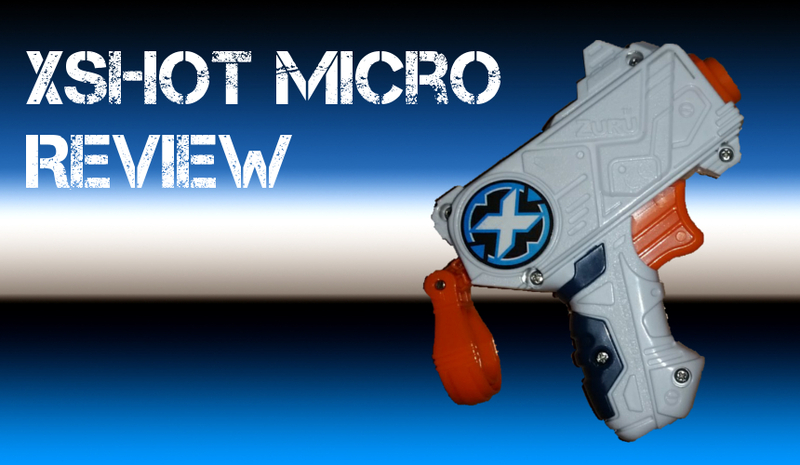 This entry was posted in Dart Blasters, Reviews and tagged 2018, blaster, blaster hub, micro, review, xshot, zuru on March 17, 2018 by BuffdaddyNerf. Nerf Game Report: Melbourne HvZ 10/3/18 Dart Zone’s Accustrike Competitor?